Second Saturday Open House is August 13th, 10am – 4pm. $5 per person, or $10 for a group or family up to four people. Bring a Lego train, and you can run it on either of our layouts. We love “guest trains”, they’re the best part of each Open House. Hope to see you there, weather forecast for Saturday is sunny & nice, come out and enjoy Brickmania, and Nordeast! Hey, it’s July! Open House is this Saturday, July 9th, 10am – 4pm. $5 per person, or $10 for a group or family up to four people. Brickmania will have the big D-Day diorama on display, but I don’t know if the USS Missouri will also be on display. Things are moving so fast at Brickmania that I can’t keep up with all the changes! Come on out, bring a Lego train or two, run them on our layouts! Second Saturday Open House is May 14th, 10am – 4pm. $5 per person or $10 for a group or family up to four people. Weather forecast is looking dreary, but Brickmania will be warm and dry. If you’re not going to “The Opener”, stop in and visit us. This month we’re having a special “Minecraft” build table, come on out and build something for display, and see what other people have built. May is also Art-A-Whirl weekend, the 20th – 22nd. It’s a great weekend in beautiful Nordeast Minneapolis, with hundreds of artist studios and galleries open for one of the largest “art crawls” in the world. Brickmania will be open 5pm – 10pm on Friday, noon – 8pm on Saturday, and noon – 5pm on Sunday. The usual displays and train layouts will be on display, but also some local artists and friends of Brickmania will have fun and interesting things for sale. Pizza Luce will be selling pizza by the slice right inside the Brickmania doors on 18th Ave. It’s a great weekend, with lots of interesting guests & visitors, and we hope to see you there! And yes, you can bring your Lego trains during Art-A-Whirl and run them on our layouts. Like us on Facebook for more updates and information. Don’t forget, World War Brick is coming in June! April Open House is this Saturday, April 9th, 10am – 4pm. $5 per person, or $10 for a family up to four. I believe the USS Missouri model will be on display on the Brickmania, along with a couple of their other traveling displays. We’ll have trains running, our new layout is slowly being built, and as always if you bring your LEGO train to one of our Open Houses we’ll pull one of our trains off the track and let you run yours. Oh, hey – tomorrow is the Second Saturday in March! That means we’re having another Brickmania Open House, 10am – 4pm. $5 per person, or $10 for a group / family up to four people. Most of the Brickmania crew is in Indianapolis this weekend, along with the USS Nicholas and USS Missouri models, but the Toyworks will be open, the play areas are ready, and we’ll have trains running all day. Weather forecast is for just beautiful, so get out, enjoy the weather, and hopefully stop in and see us! And have you ‘Liked’ us on Facebook, yet? Wait, February? What happened to January? Well, turns out we’re lousy at promoting ourselves, and I just forgot to post. So, I’m posting for February. February! Open House! Saturday, the 13th. Valentine’s Day weekend for those of you who worry about that. Me? I’ll be hanging out at Brickmania from 10am – 4pm, running trains and answering questions, and maybe doing some building? Layout #5 is slowly advancing, we’re adding lights and more details. Still a long ways to go, but things are happening. Come on out and see us! If you bring your LEGO train, you can run it on one of our layouts. A quick reminder that the Brickmania Toyworks will be open every Saturday in December. 10am – 4pm each Saturday. Admission is $5 per person, or $10 for a group up to four people. We’ll be running trains on the 5th, the 12th, the 19th, and Boxing Day (the 26th). We hope to see some guest trains this month! November Open House is this Saturday, November 14th, 10am – 4pm. Brickmania Toyworks, on 18th Ave just west of Central Ave in beautiful Nordeast Minneapolis. Plans are to have the three biggest ships in the Brickmania fleet be on display Saturday: The LST 325, the USS Nicholas, and the world famous USS Missouri. This might be the first time all three have been set up at a single Open House. The GMLTC is still working on layout #5, it’s getting taller and we’re building the transitions between the taller sections and the shorter sections. No idea when we’ll start tearing down the rest of layout #4, that probably starts in early 2016. Come out and see us on Saturday! And as always, if you bring your LEGO train you can run it on one of our layouts. Second Saturday is tomorrow, October 10th. 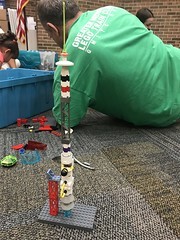 Open House day at Brickmania! We’ll be there 10am – 4pm, weather forecast is looking really good, we’ll have trains running on both of our layouts and our neighbors the TCLTC will have trains running too. 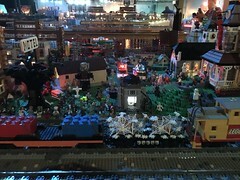 Admission to Brickmania is $5 per person, or $10 for a family up to four people. And as always, if you bring your Lego train to one of our events, you can run it on our layout! Due to popular demand, the good people at Brickmania have decided to start having Open Houses again. Same as before, second Saturday of each month, 10am – 4pm. First one will be August 8th! The current plan is to have Dan’s new USS Missouri on display in the big room, after it makes a trip to Hartford, CT and Evansville, IN. Those of us in the train room are really looking forward to seeing everyone again. And bring your guest trains!